Highland Park ICE, 17 Year old Single Malt, the best whisky you’ll never drink. Highland Park, a far flung distillery that uses lots of ye olde Norse legends to sell its whisky and to be fair to them I’ve had a few over the years and never had a bad one so was delighted if not a wee bit surprised that they sent me a generous sample of their new ICE, a 17 Year Old Single Malt bottled at 53.9%. I have a bit of a problem with this whisky. First off I don’t really go for anything labelled at collectors, I don’t like collectors who collect just to make money with no intention of drinking the whisky, I’ve said this before and I’ve ranted enough on the subject and this whisky is aimed at collectors. I know it’s aimed at collectors because it follows on from the Valhalla collection, which was, you know, aimed at collectors, but the thing that really annoys me about this is how good it is. It’s a cracking whisky, I’ve yet to have a Highland Park which isn’t spot on and the 18 Year Old in particular is a wonderful whisky, I’ll review later but I’ll be ranting a little more first. Oh yeah, it’s ONE HUNDRED AND NINETY POUNDS a bottle and for me, despite it being an excellent whisky, is too much, way too much and that’s a real shame, and by posting this almost certainly means I won’t be getting any more nice wee gifts from Highland Park, remember folks you could add a tenner and get two bottles of the excellent 18 Year Old and give one to me for the price of this. 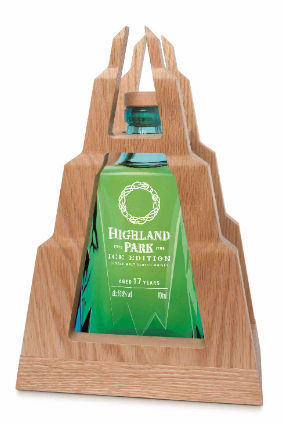 If anyone at Highland Park is still reading this let me make a suggestion, why not make one thousand bottles of this using a sculptured bottle in crystal and surrounded by a wooden frame thing, it also comes with a watercolour by Andy Bowman which I guess it cool, but then sell the other twenty nine thousand in normal bottles for a normal price to the rest of us who are interesting in drinking and enjoy new whiskies, just a thought. Okay so, as I’ve now well and truly stuffed my chances of getting any more samples I might as well review. Nose. An almost herbal smokiness, dried tropical fruit mix and then fresh crisp apples. Vanilla which you’d expect from ex bourbon cask, little back drop of cherry flavoured pipe tobacco too. Palate. Sweet and smoky, I’ve added a drop of water to this, I do it with most whiskies but I would recommened it with anything over 50% as this is. Sweet white grapes, over ripe pears and candyfloss all of which have been flung on a BBQ. It’s a very interesting dram indeed. Finish, Heat and smoke linger in the background with some bourbon oak and vanilla. So there you have it, would I spend sixty or seventy quid on this? Aye. Would I spend nearly two hundred just to have the nice bottle and a wee booklet etc? No, no I would not. As a final note I would actually ban all excess packaging, I’ve been told that even a cardboard box adds a couple of quid to the bottle price but it’s more than just the cost, the world is burning and it’s up to all of us to keep our carbon footprint in check and buying a bottle of whisky which comes in layers of packaging is wasteful and there are only so many tubes I need for paint brushes and the like.